“FASTEN YOUR SEATBELTS, IT’S GOING TO BE A BUMPY NIGHT!”: ‘All About Eve’ is my obsessive favorite film of all time. I own film memorabilia from the film and had the extreme privilege to meet Celeste Holm in 2011 and even attended her 95th birthday party. I thought I had died and gone to heaven when she signed my original 1950 film poster for me. 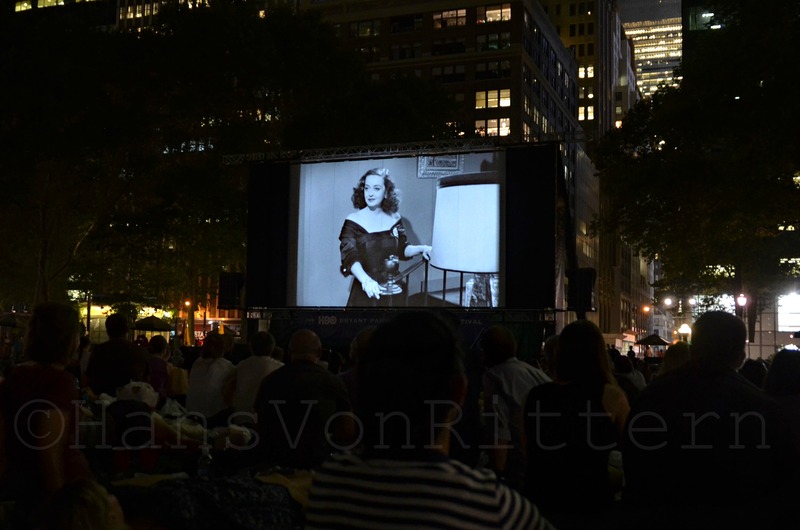 Imagine my euphoria to find out Bryant Park’s and HBO’s Film Festival was showing ‘All About Eve’, Monday August 13th, 2012. I would have attended if I had the plague. Approximately 10,000 people showed up to see Marilyn Monroe ascend the staircase on George Sander’s arm and make her entrance in the party scene just after Bette Davis as Margo Channing utters one of the immortal film lines of all time: “Fasten your seat belts, it’s going to be a bumpy night!” The audience stood up, hooted, hollered, cheered, whistled and applauded. It is a truly unique New York experience and I was in heaven . . . This entry was posted on August 19, 2012 by newyorkcityinthewitofaneye. It was filed under Uncategorized and was tagged with 1950 classic film black white, All About Eve, Anne Baxter, Bette Davis, Bryant Park, Celeste Hom, classic films, film quotes, Gary Merril, gay, George Sanders, Hans Von Rittern, HBO, Manhattan, Margo Channing, Marilyn Monroe, New York City, New York experience, outdoor film festival, Thelma Ritter.